This day was spent at the racetrack! Albeit the slowest race on Earth, but it was a day at the races nonetheless! Alright, I’ll stop speaking in vague terms lol. 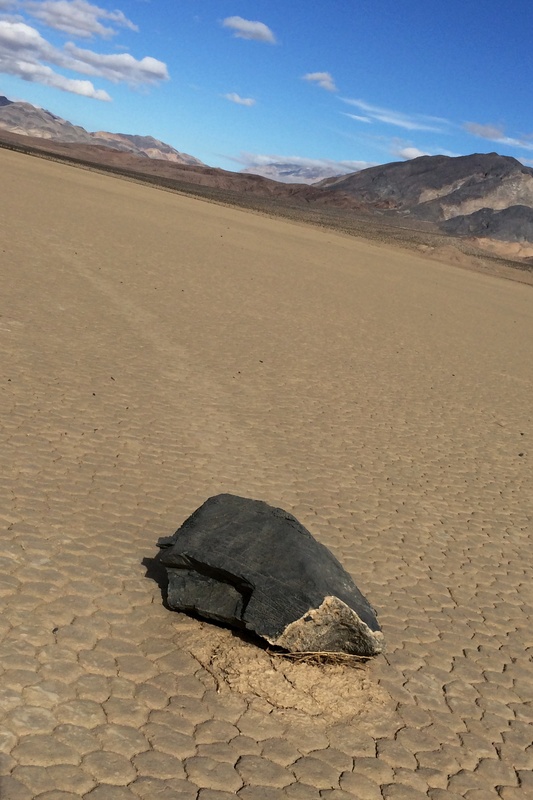 The sailing, or moving, stones at the Racetrack in Death Valley National Park have long been a mystery for both scientists and interested parties since their discovery nearly a century ago. I myself have been intrigued since I saw a program on the History Channel when I was a kid and finally got to check this sight off my bucket list! This is actually my second time at Death Valley National Park in the past year. And there is still so much to see and do I can’t wait to go back a third time. 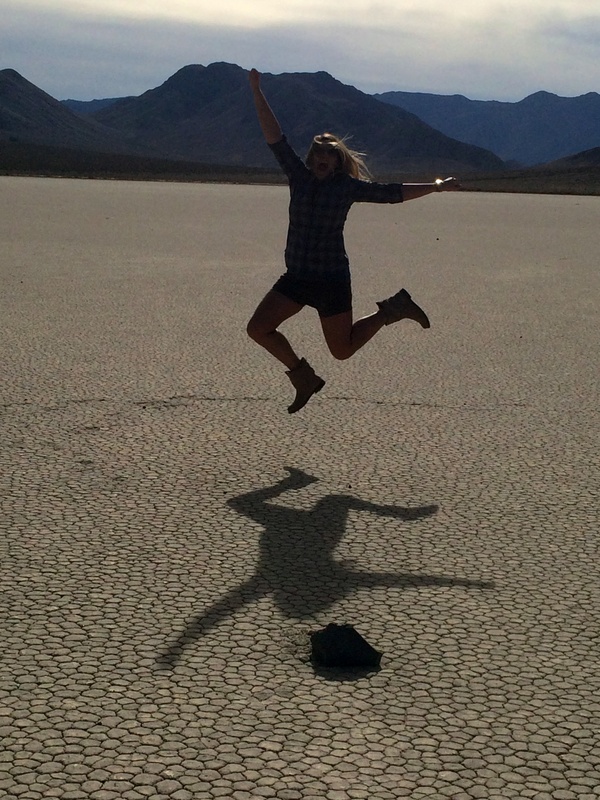 When I was in Death Valley a year ago I was not able to visit the Racetrack. But this trip I properly planned for the grueling drive to the Racetrack and it’s truly a one in a lifetime trip that was a childhood dream come true for me! 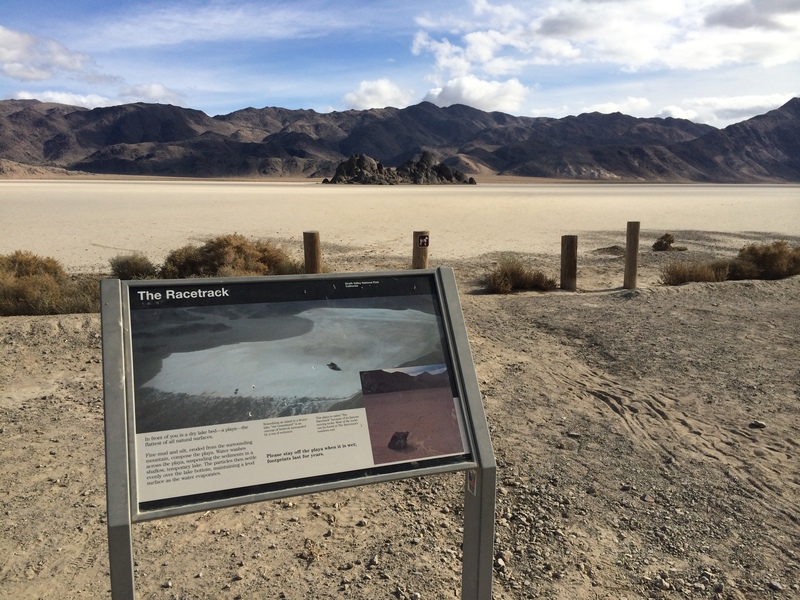 The Racetrack is a playa, meaning a dry lakebed, about 3 miles long and 2 miles wide. The most unique feature of this playa and the mystery behind it are the sailing stones. 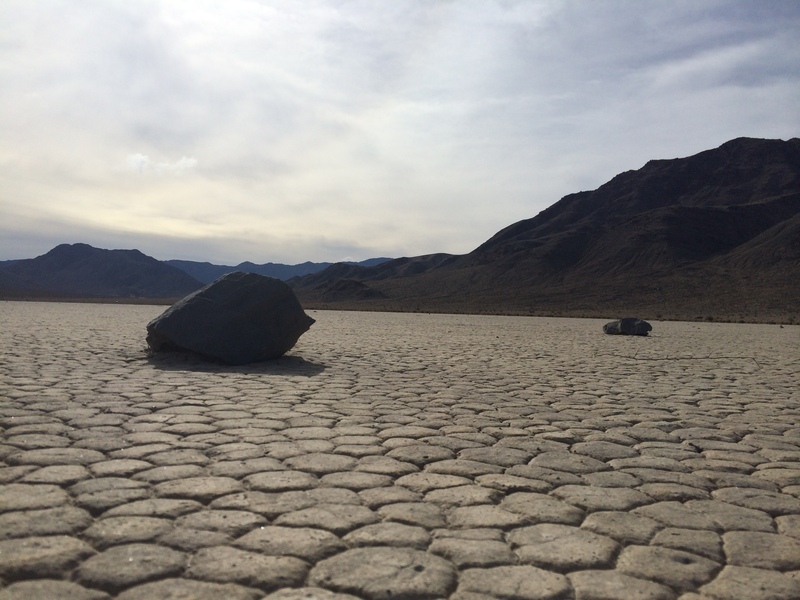 Until recently, the method to how these stones moved across the playa was left to theories. But in December of 2013, two scientists were in the right place at the right time and witnessed the stones moving. These scientists proved that the rocks move by the rare combination of rain and wind. For the stones to move the following conditions must be present: 1) there needs to be rocks on the playa that have fallen from the nearby mountainside; 2) there needs to be rain, which is a very rare occurrence in Death Valley as a whole; 3) the temperature needs to drop in order for the water to freeze on the playa; 4) the ice needs to then thaw; and 5) a breeze needs to come along to break up the thawing ice and move the ice panels across the shallow water on the playa, thus moving the stones. The scientists note the rocks move at about 5-18 feet per minute during this occurrence, so it is indeed a very slow race. The sailing stones are a truly rare phenomenon and it’s incredible that those scientists were there to finally witness the stones racing! Read more about how the stones move here. 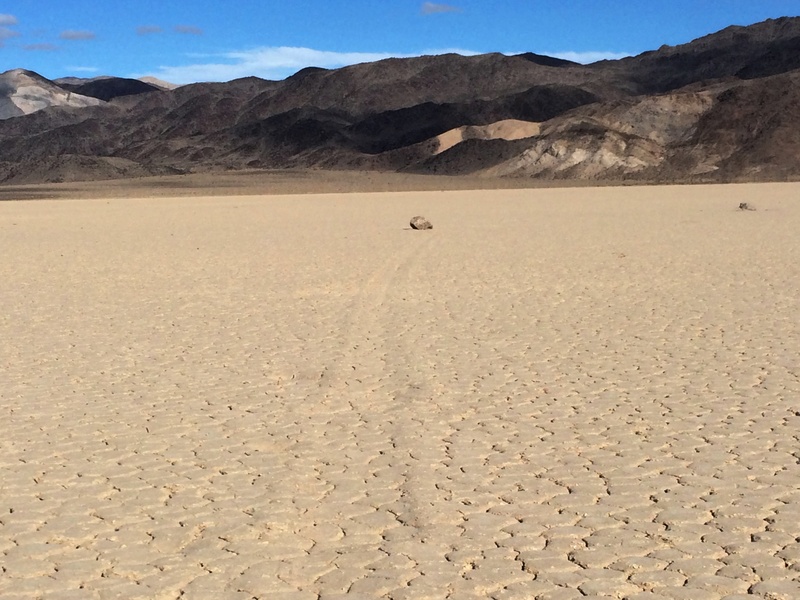 The Racetrack is a remote destination deep in Death Valley National Park. 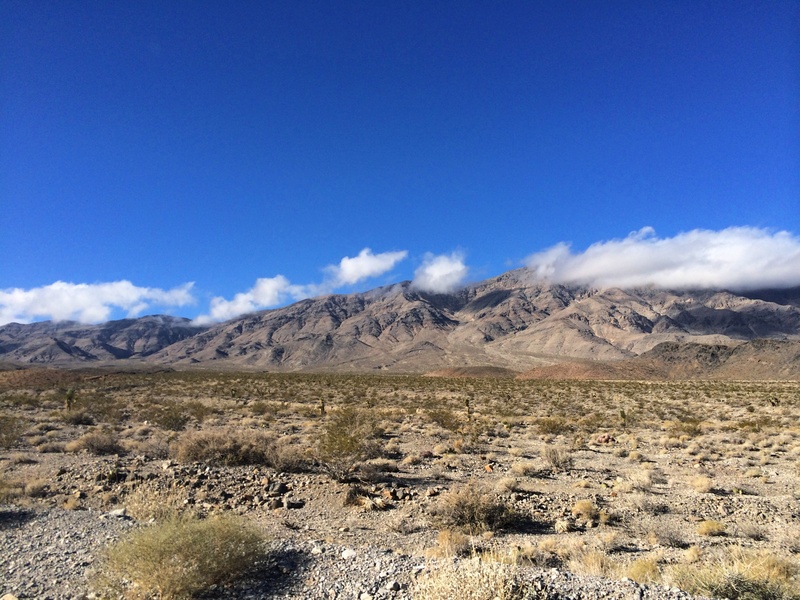 It’s 28 miles from the paved road near Ubehebe Crater, but the entrance to the gravel road to the Racetrack is about 1.5 hours from our hotel at Furnace Creek. So we drove 56 miles just to get to the start of the road to the Racetrack, and then it took another hour and a half and 28 miles of driving on a washboard gravel road to actually arrive at the Racetrack. Also during this whole trip we gained 3,500 feet in altitude which is another reason, aside from the dry heat, to drink lots of water and be well-rested! 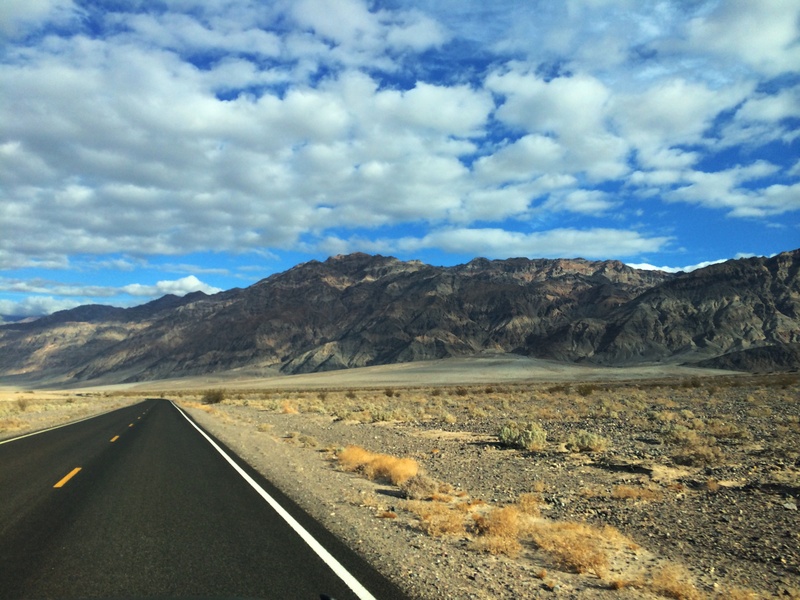 There is nearly one thousand miles of paved and dirt roads in the 3.4 million acres in Death Valley National Park. 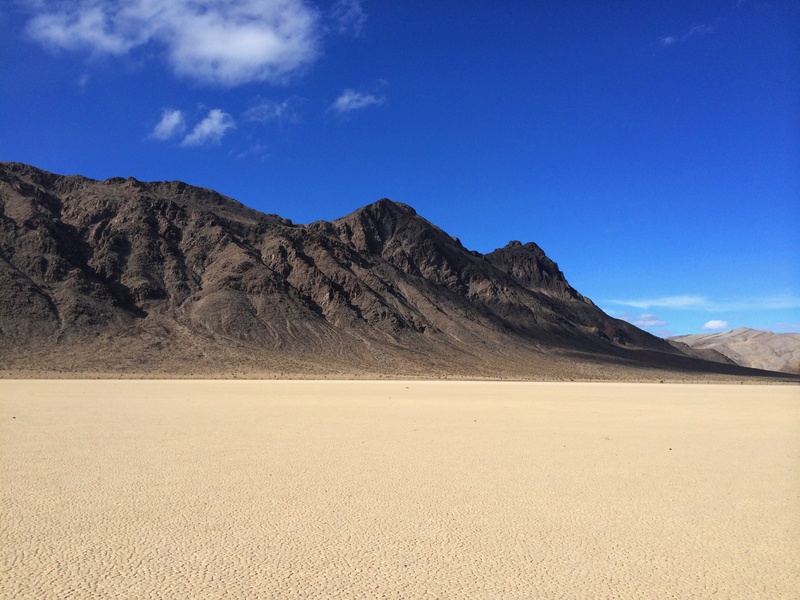 Death Valley features salt flats, mountain ranges as tall as 11,000 feet, colorful and winding canyons, sand dunes, and even a castle in an oasis! Since I did not have a proper vehicle for my first attempt to visit the Racetrack, this time I rented a Jeep Wrangler from Farabee’s Jeep Rentals, which I highly recommend! 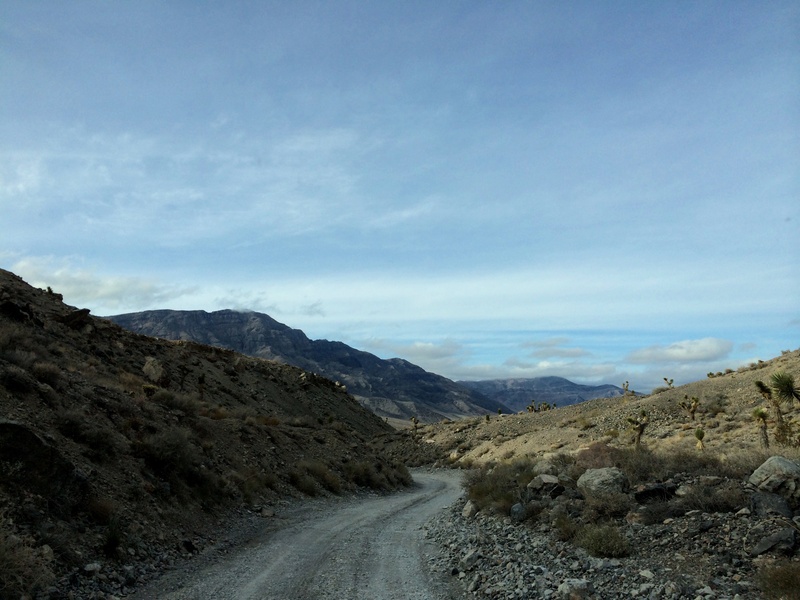 A 4WD vehicle with high ground clearance is recommended for this trek or any of the back country roads in Death Valley. The washboard gravel road is very rough on a vehicle, and though it is possible to drive it in a non-4WD vehicle I would not recommend it. Might as well put all that wear and tear on a rental vehicle specifically designed for this drive! Though it’s pricey to rent from Farrabee’s it is well worth it in my book. 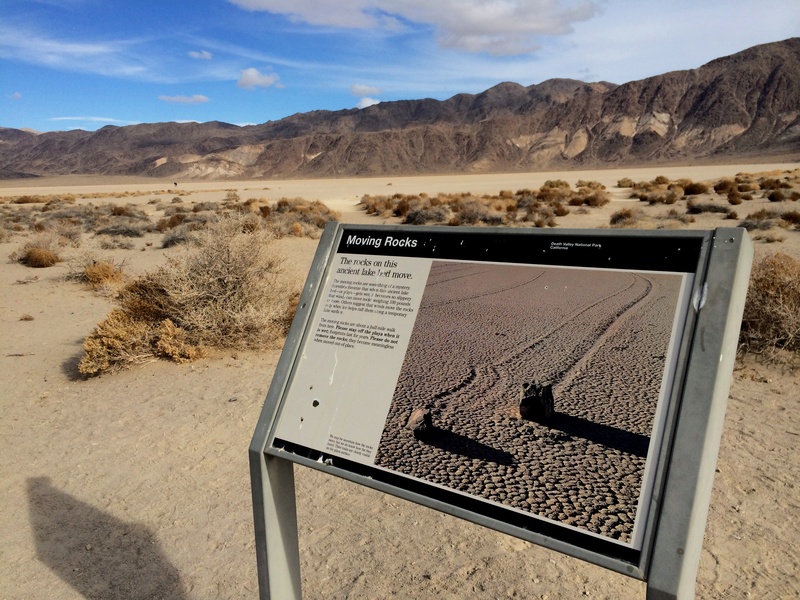 Not only are they located right there in Death Valley National Park, they also provide you with free ice and water, detailed maps with current backcountry trail information, and most importantly a SPOT Satellite GPS Messenger for tracking in case of emergency. Plus all there jeeps are equipped air conditioning, automatic transmission, 2″ lift kits for additional clearance, and heavy duty tires for protection against the sharp rocks. 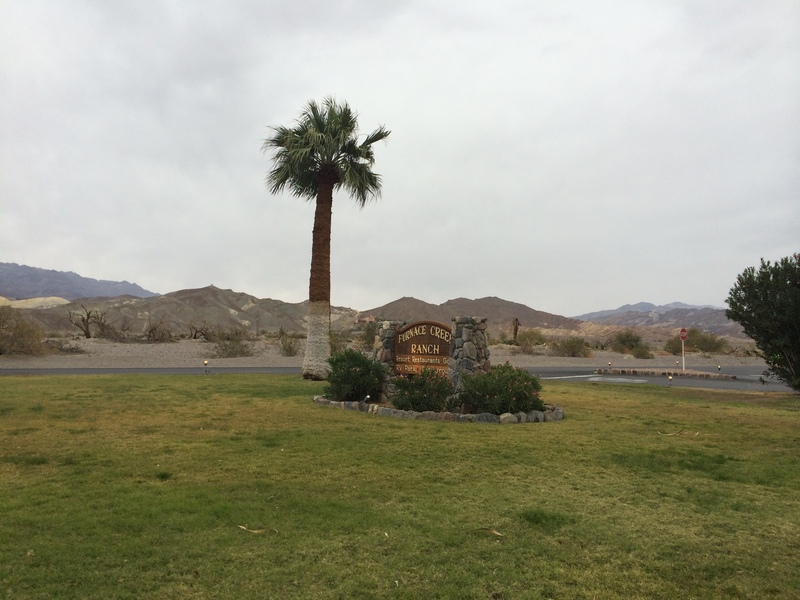 The Ranch at Furnace Creek features a general store, swimming pool, and three restaurants. On Monday we woke up early and picked up our Jeep at around 8AM. Then we started our trek to the Racektrack. The total mileage from our hotel at Furnace Creek to the Racektrack is about 80 miles and took us about 3 hours to drive. But 28 of those miles are on a washboard gravel road and it is a slow and jarring journey! 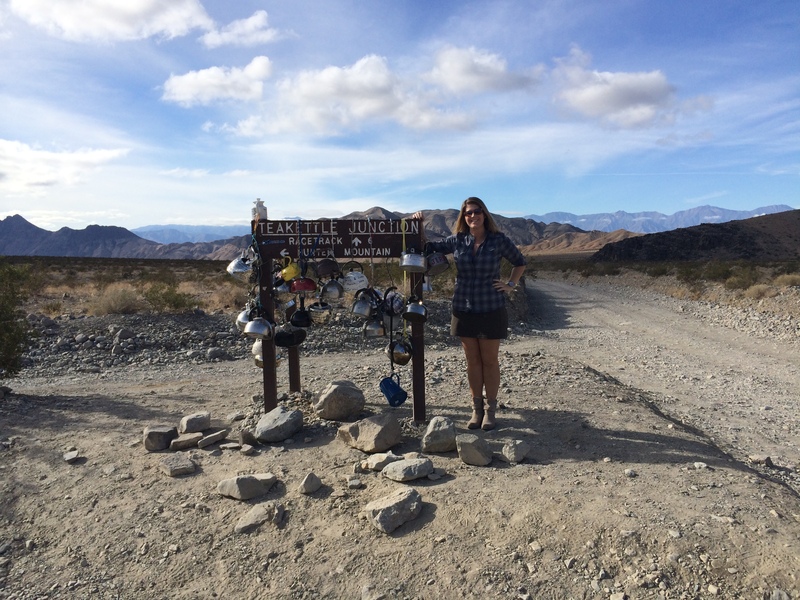 We made a brief stop at Teakettle Junction which is at the 21st mile marker and means you are almost to the Racetrack. You can also turn at this junction to go to the Lost Burro Mine, which operated during the late 1800’s and again during World War I. This is where we leave the nice, smooth paved road for 28 miles of bumpy, jarring unpaved road! A beautiful day for our drive to the Racetrack! The road is worse than it looks from this pic. If you need a tow truck it’s going to cost you about $1,000 and take them a couple hours to get there! 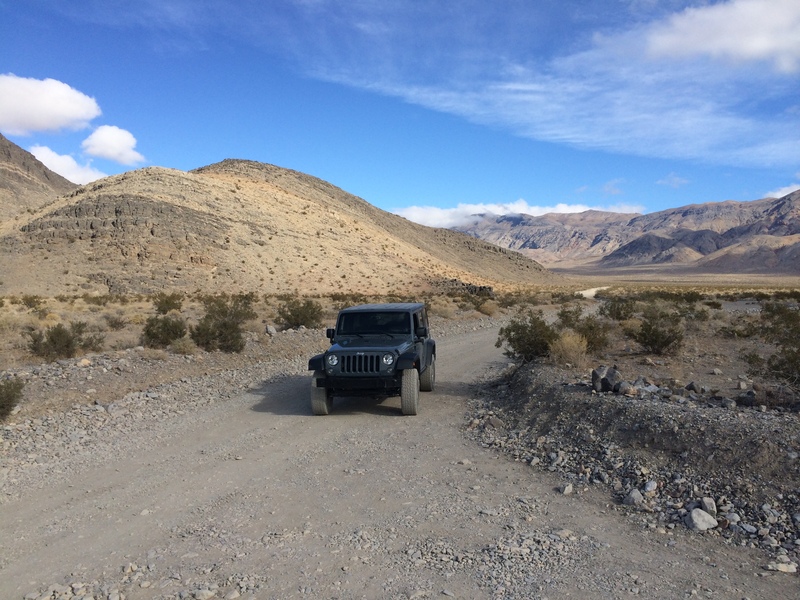 Plus there is zero cell reception and very little in Death Valley in general, so a benefit of renting from Farrabee’s is that they gave us a GPS for emergency use. At Teakettle Junction people leave teakettles with messages to mark their visit. At most we could drive about 30 miles per hour, but usually slower than that to avoid the big rocks and deep rivets in the road. We arrived at the Racetrack around 11:30AM and only passed one car. 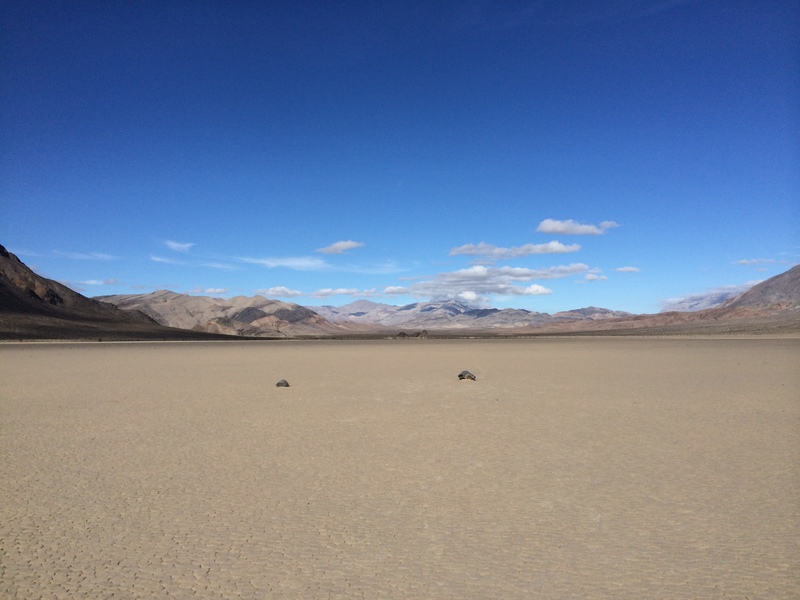 There was no one else on the playa when we first arrived and it was incredible to have this huge expanse all to ourselves! A few more people did arrive later but it’s so huge we hardly even noticed the other people. My first glimpse of the Racetrack in the distance! We parked at the first parking area by the Grandstand on the north end of the Racetrack. The Grandstand is an island of quartz monzonite that offers a great view of the Racetrack. We did start walking towards the Grandstand but then I was too excited to see the moving stones and started walking south to find the rocks. As I began walking from the north end it didn’t look that far, but looks are deceiving. The Racetrack is huge, nearly 3 miles long….and I nearly walked the entire length! Instead of parking near the Grandstand, drive to the far end of the playa and start walking from there. The southeast side is where most of the sailing stones are. We realized this as we started walking on the north end but then didn’t think it looked that far to the south end, but we just kept walking and walking and walking haha. Years of dreaming about being here and I finally made it! We started walking here, near the Grandstand, thinking it didn’t look that far to the other side but let me tell you it is faaaaaaaaar! A panoramic view of the Racetrack from the north end near the Grandstand. Some of the first stones I came across, but you can barely see their tracks. So much walking to find stones with tracks…I’m just gonna rest here for a moment. But first let me get a rock selfie! The first rocks we came across did not have any tracks, but the further south I walked I finally found them! It’s probably best to visit after some rain because there could new tracks. There were just a few tracks visible when I was there because it hadn’t rained in a long time and thus new tracks hadn’t been formed for awhile. But the downside of going after the rain is there are selfish people that walk on the playa and leave footprints all over which ruins the experience for others. It’s great that the Racetrack is more well-known and traversed today, but along with that comes damage from higher traffic volume. So please, if you visit be mindful of the imprints you leave behind. 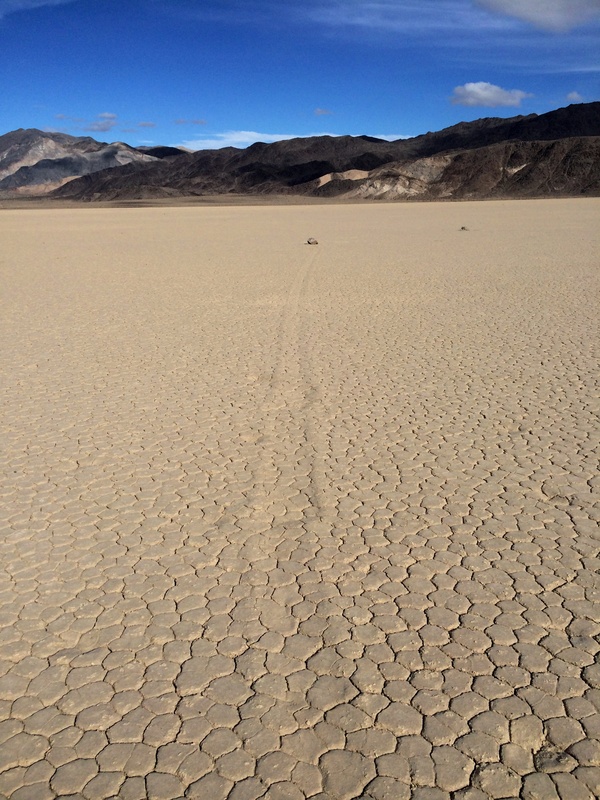 Death Valley only gets about two inches of rain per year so your footprints will remain on the playa for years. Luckily, there were not too many footprints when we visited and you can see my photos of the sailing stones below! I found my first sailing stone! The Racetrack is nestled in a remote valley between the Cottonwood and Last Chance Mountain Ranges. It was a gorgeous day when I visited, in the 80s (which is cool for Death Valley haha) but sometimes that could be worse because you don’t realize just how thirsty you are. I drank five bottles of water during our drive to and from the Racetrack and I never had to pee. 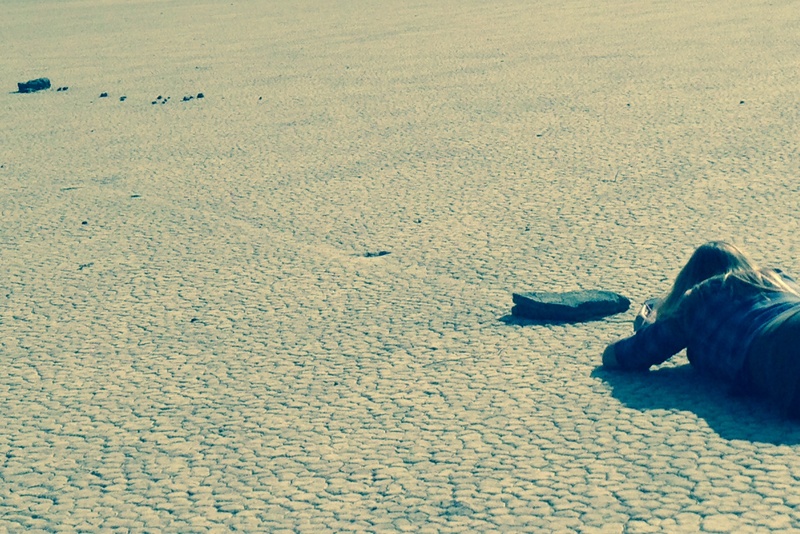 That shows how quickly you can get dehydrated in Death Valley! Be sure to drink lots of water! 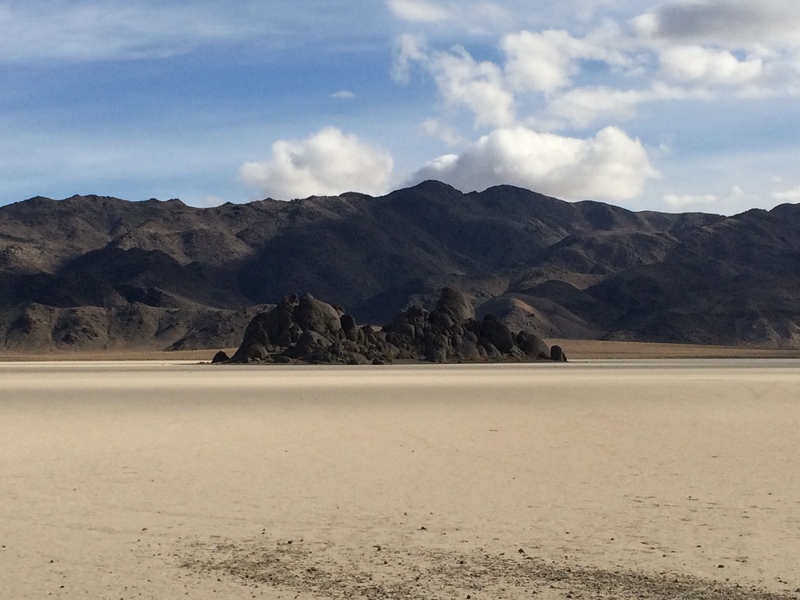 The rocks fall from this nearby mountainside onto the playa and slowly overtime slide their way across the dry lakebed when the right weather conditions exist. 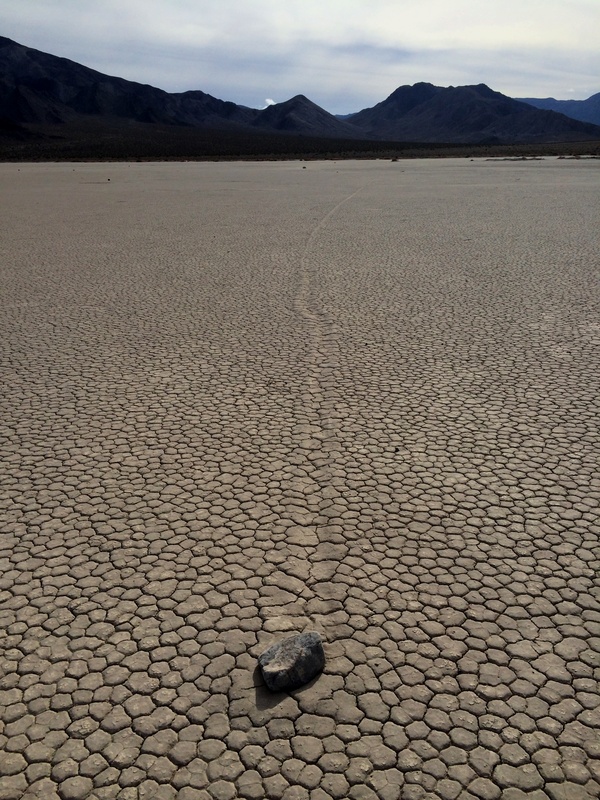 The phenomenon of the sailing stones has been studied since the early 1900s, and finally in 2014 researches finally witnessed the stones in motion and solved the mystery! 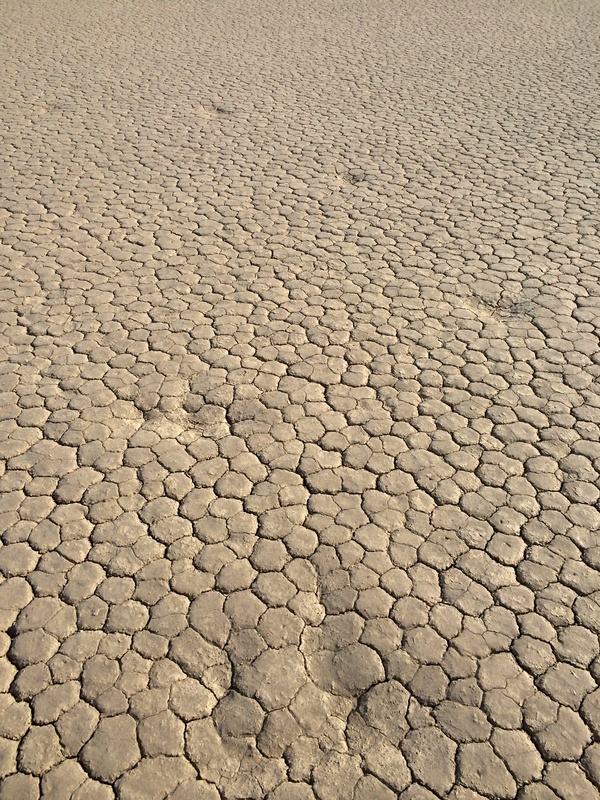 As the mud of the playa dries after rainfall, it shrinks and cracks into a mosaic pattern of interlocking polygons. The Racetrack is extremely flat with the northern end only elevated 1.5 inches higher than the southern end. It’s very sad that a lot of stones have been taken. Here you can see the indents where stones used to sit. Even I admit that a part of me wanted to take a rock because I have been fascinated by the Racetrack for most of my life and how cool of a souvenir would one of the sailing stones be! 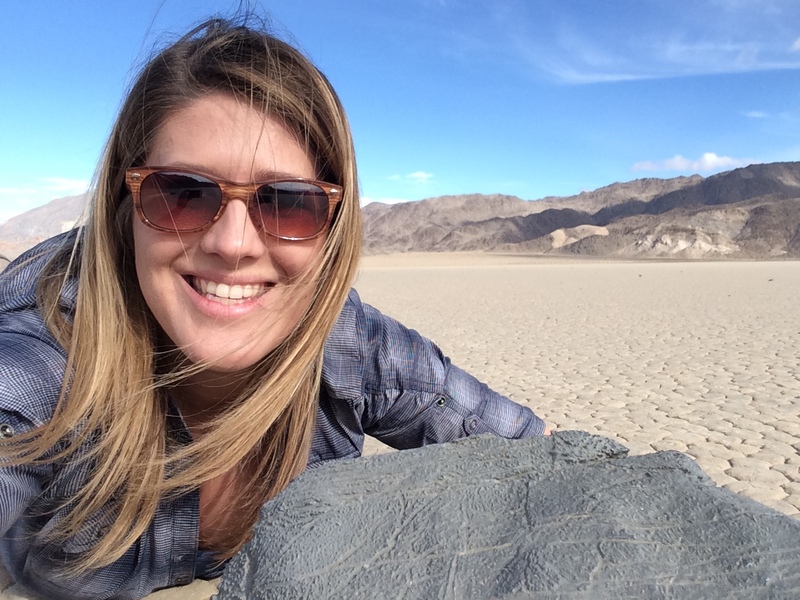 But it is very selfish to take one of the few rocks that land on the playa because then no one else gets to enjoy the experience that I did. So please stop taking the rocks, people! 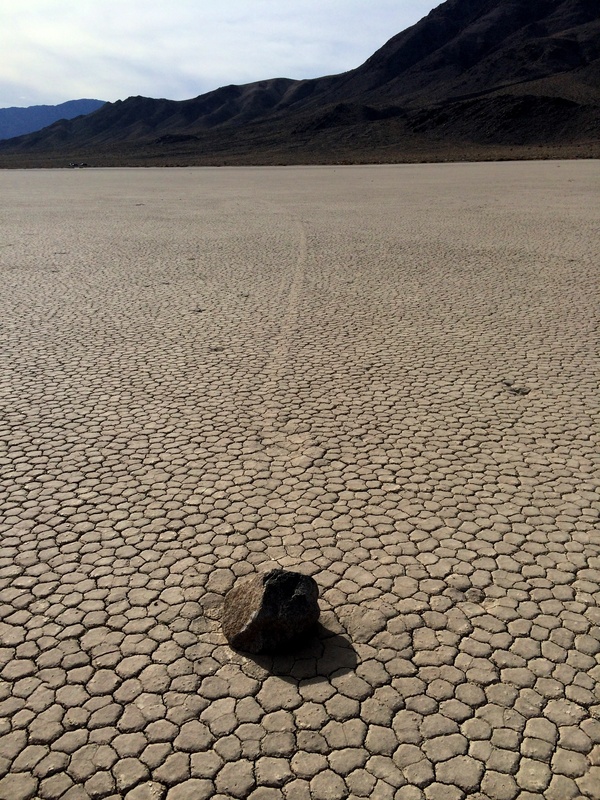 It’s a rare occurrence for these rocks to land on the playa in the first place, and even rarer occurrence when they move across the lakebed. Don’t ruin it for others! But many stones still remain at the Racetrack and you can see their long tracks into the distance. This stone left a good track! 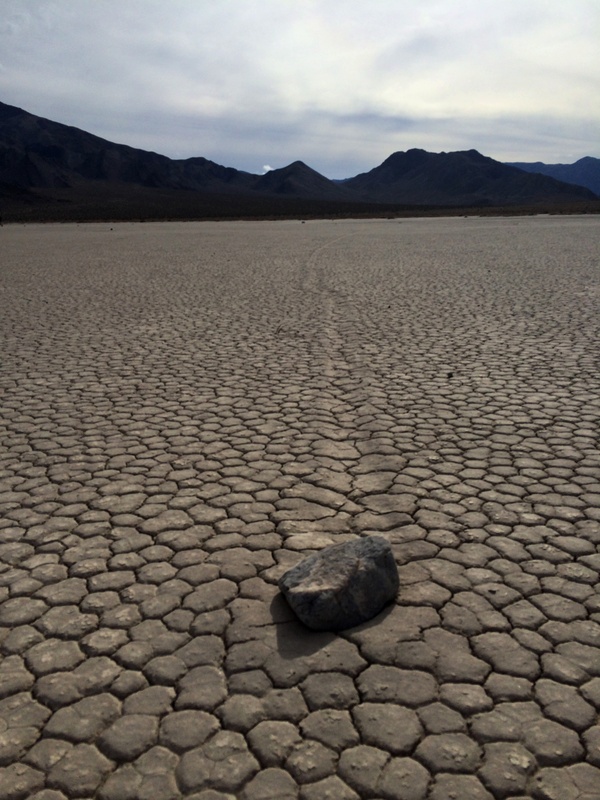 Some of the sailing stones are up to 600 lbs! Though it was a grueling drive into this remote valley I am beyond excited to finally see these stones in person! This sailing stone had a long track! The south end of the Racetrack. After a couple hours of walking all over the playa and finding several sailing stones, I was satisfied and ready to head back. We did have an hour and a half drive ahead of us on that rough washboard gravel road, and then another coupe hours back to our hotel. Visiting the Racetrack is an all day event and luckily we had a smooth visit with no car troubles. 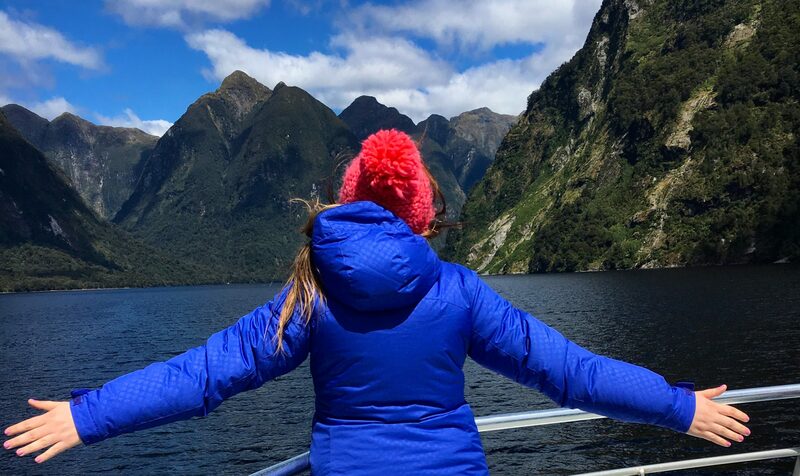 But definitely plan accordingly if you want to visit and either rent a Jeep or make sure your vehicle is prepared for the journey. I highly recommend visiting the Racetrack if you find yourself in Death Valley. 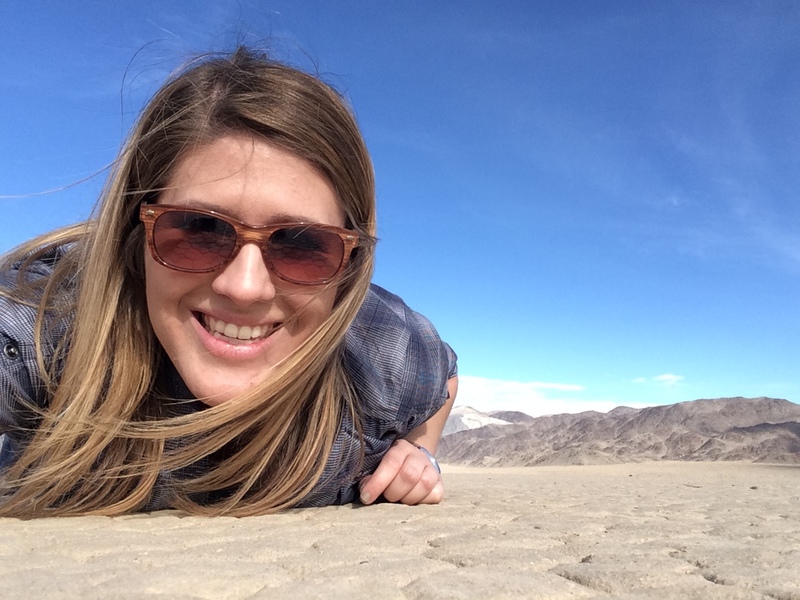 This off the beaten path destination is well worth it and it is my favorite place I’ve visited in Death Valley! There is an enormous Joshua Tree forest on the way to the Racetrack. Joshua trees are often confused for cactus, but they are actually a type of yucca tree. Joshua trees can grow up to 30 feet tall! 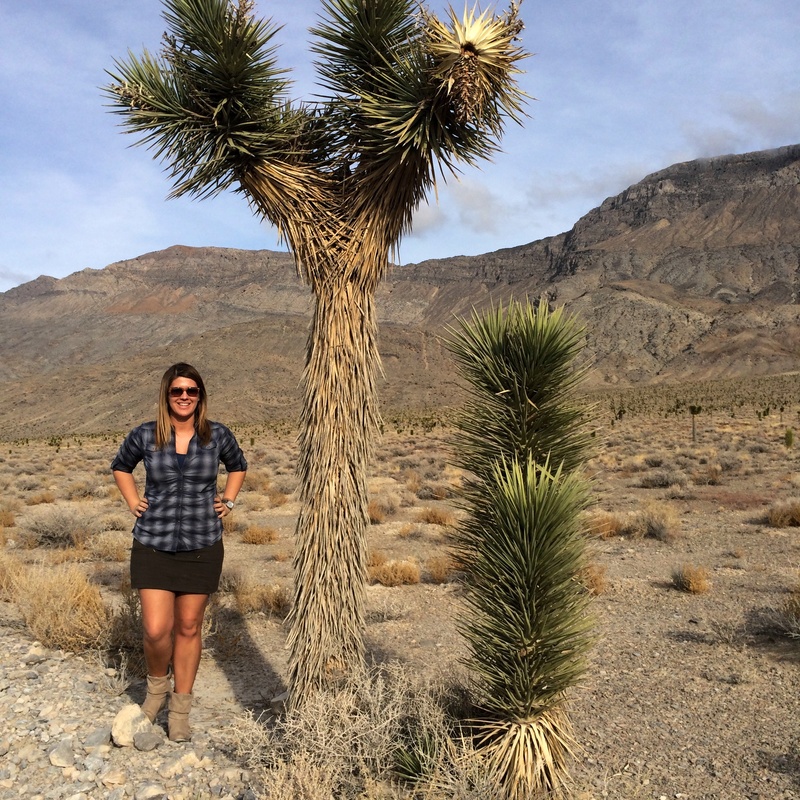 I was amazed at how many hundred of acres of Joshua trees there are on Racetrack Road! 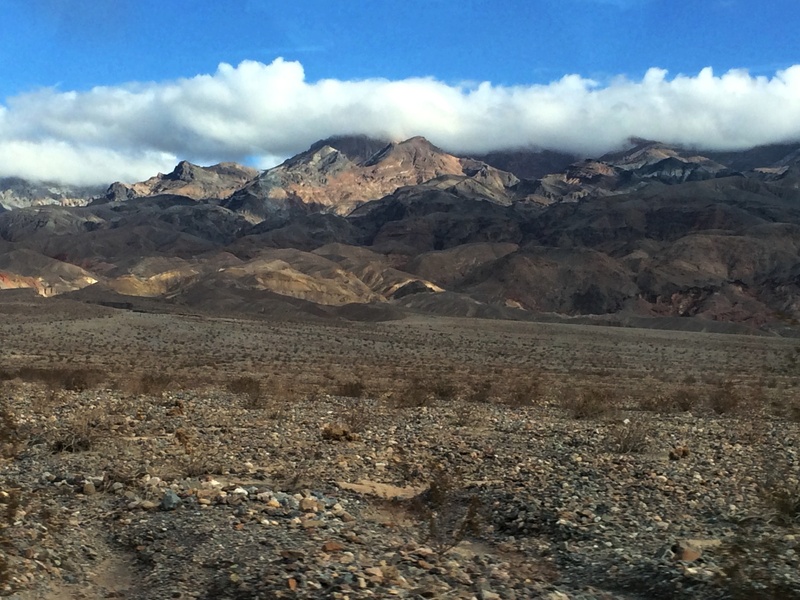 A sweeping view of Death Valley National Park on our way back from the Racetrack. 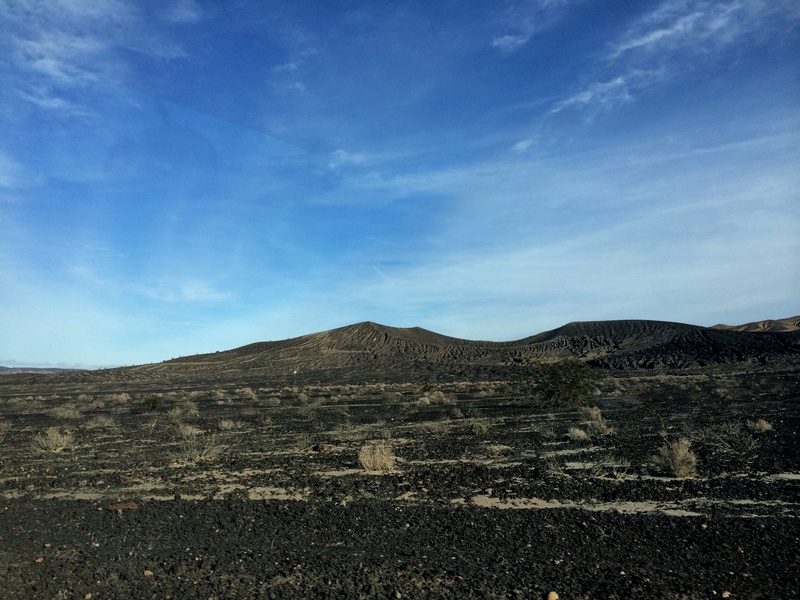 On our drive out we passed some volcanic landscape on Racetrack Road near Ubehebe Crater. Once we were thankfully back onto paved road, we made a brief stop at Ubehebe Crater. It’s located right near the entrance to Racetrack Road and you can make it a quick stop or turn it into a hike along the rim or down into the crater if you want. 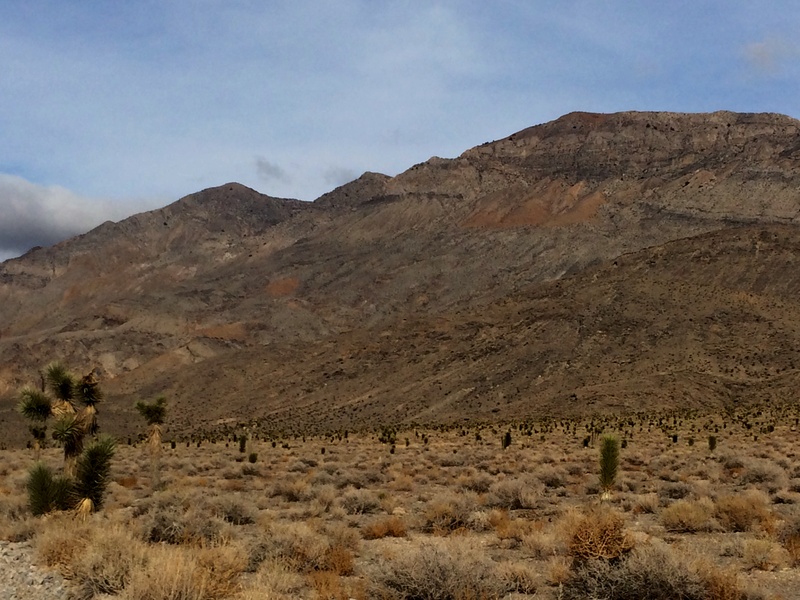 I wrote more in depth about Ubehebe Crater during my first visit to Death Valley here. 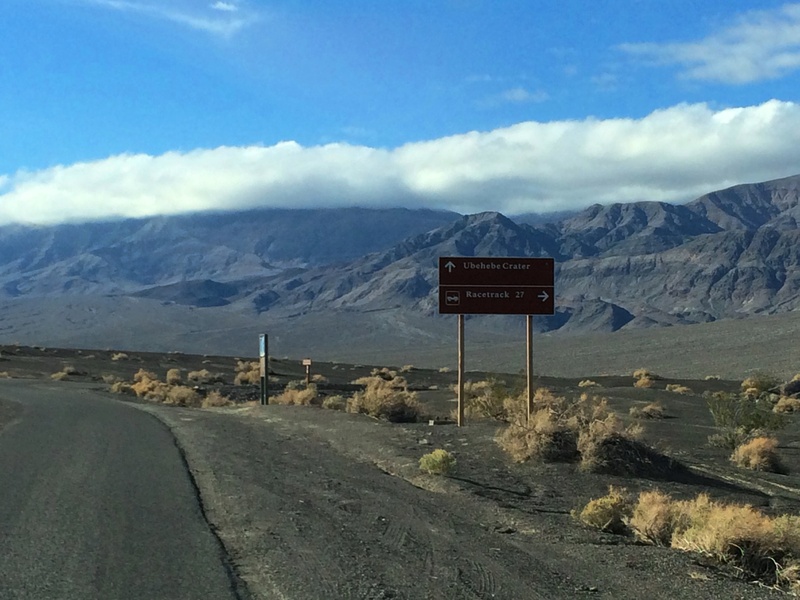 You can park right at the rim of Ubehebe Crater and take in the beautiful panoramic view! We had a couple more hours drive back to our hotel (Death Valley has over 1,000 miles of road!) and were treated to this beautiful sunset! 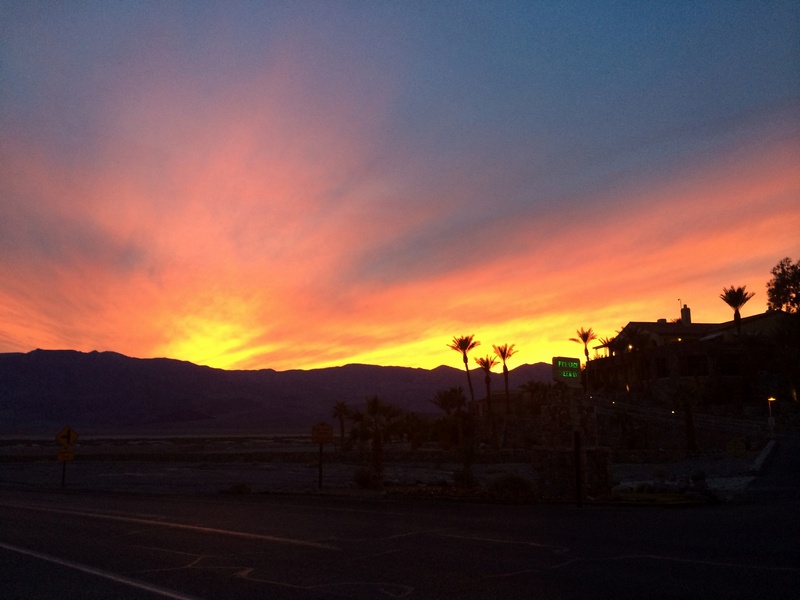 I was impressed with all the colors of the sunset in Death Valley! The next day it rained which is not a common occurrence, with Death Valley only averaging 2 inches a year, so although it made us cancel our plans to visit the Leadfield ghost town in Titus Canyon, it was cool to see it rain in Death Valley. And we were very grateful it didn’t rain on Monday and ruin our plans to visit the Racetrack. The final leg of our road trip was to Los Angeles but we made a brief stop at another ghost town, Rhyolite, first. Rhyolite is an easy to visit site just a mile off Highway 374 near the eastern side of Death Valley National Park in Nevada. I did not stay too long because of the rain but we drove around the ghost town and observed the remains of this once booming mining town. Rhyolite fell almost as quickly as it rose. The town began in early 1905 along with several other mining camps that were established after the discovery of gold in the surrounding hills of Bullfrog Mountain. Word quickly spread and thousands of prospectors flooded the area with many of them settling in Rhyolite, due to the promising Montgomery Shoshone Mine that was in Rhyolite. The town grew to 2,500 people by June of 1905 with 50 saloons, 35 gambling tables, 19 lodging houses, 16 restaurants, half a dozen barbers, a public bath house, and a newspaper. In 1906, industrialist Charles M. Schwab bought the Montgomery Shoshone Mine, which handled 300 tons of ore a day, and invested heavily in the town. By 1907, the town had a population between 3,500 to 5,000 and had electricity, water mains, concrete sidewalks, railroad transportation, daily and weekly newspapers, a hospital, a school, two churches, an opera house and a stock exchange. 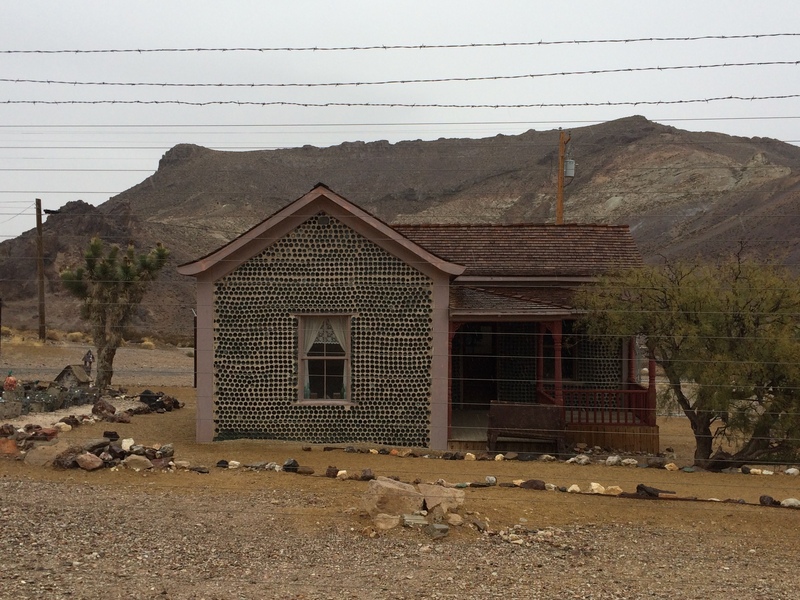 Rhyolite is the wholly encompassing definition of a boom town. 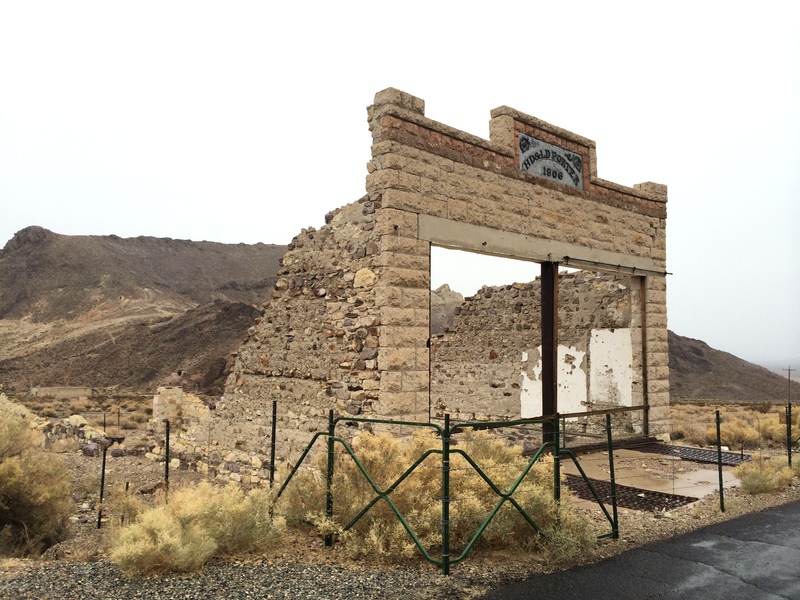 After the 1906 San Francisco earthquake and the subsequent financial panic of 1907, Rhyolite struggled to raise development capital and the town began to severely decline. By 1910, the mine was operating in the red and was officially closed in 1911. Without the town’s main source of industry, the townsfolk moved elsewhere and by 1920 the census reported only 14 people living in Rhyolite. With tourism flourishing in the nearby Death Valley in the 1920s, Rhyolite became a tourist attraction and the setting for many movies. Most of the dilapidating buildings were salvaged for building materials in nearby Beatty, Nevada and only the train depot and bottle house were preserved. In 1937, the train depot became a casino called the Rhyolite Ghost Casino, and then later became a small museum that stayed open until the 1970s. A gloomy day for exploring a ghost town. The ruins of the John S. Cook & Co. Bank building in Rhyolite, Nevada. 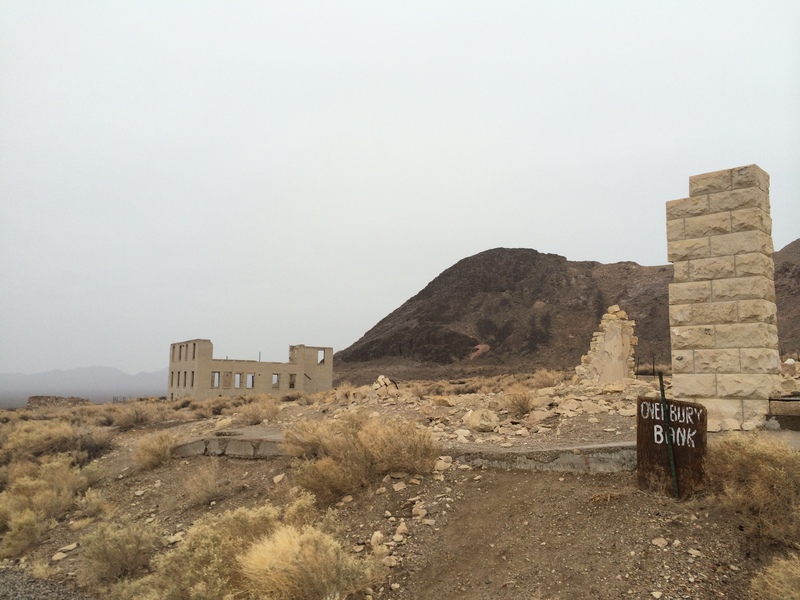 This once three-story bank was the most prominent building in Rhyolite. It was built in 1908 and cost the equivalent of over two million dollars today. The John S. Cook & Co. Bank also housed brokerage offices and a post office. In the forefront is the once three-story Overbury building and jewelry store, and in the background is the once two-story eight-room school. Not the best weather for exploring haha. HD & LD Porter Store, established in 1906, was the general store for the mining town of Rhyolite. The California-mission style train depot had three railroads serving Rhyolite. The depot cost the equivalent of several million dollars today. It later became a casino in 1937 and is privately owned today. The last train left Rhyolite in July 1914 and in 1916 the light and power were finally turned off in the town. 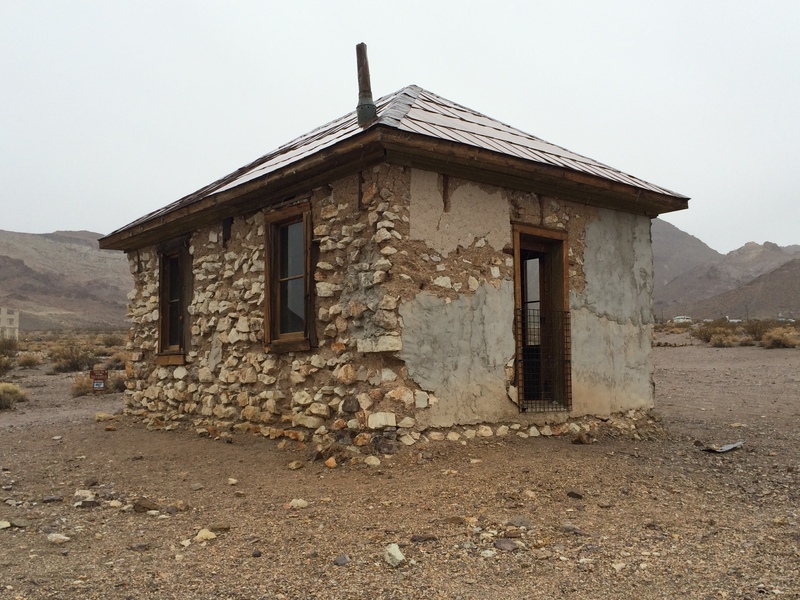 Rhyolite practically became a ghost town overnight after the mines closed in 1911. 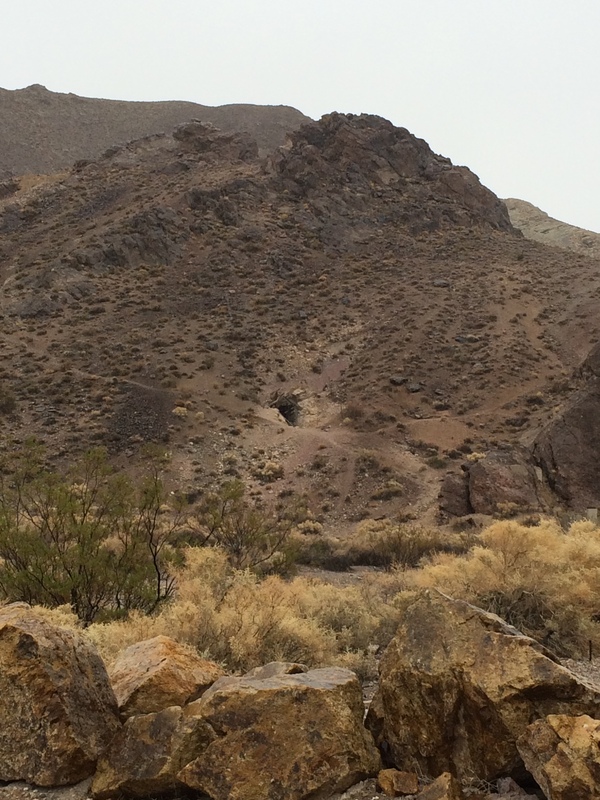 Rhyolite encompases huge area and you can hike up to the abandoned mine shafts, but it was too rainy for me to explore beyond the main roads. Most of the buildings’ remnants were salvaged for building materials in the nearby town Beatty, Nevada. Another abandoned mine entrance spotted in the Bullfrog hills. Rhyolite fell nearly as fast as it rose. Founded in 1905 and essentially abandoned by 1920, with the last official resident passing away in 1924. 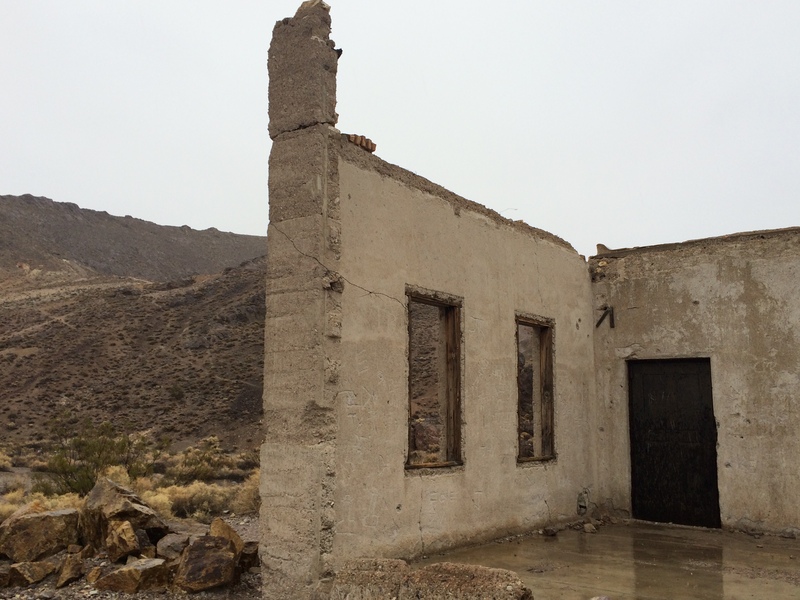 Today, Rhyolite stands as a reminder of how fast a town can rise and thusly fall. Several remnants of the boom town remain such as the three-story bank, the jail, the school house, and several other ruins. The train depot and bottle house are the only two buildings left intact. 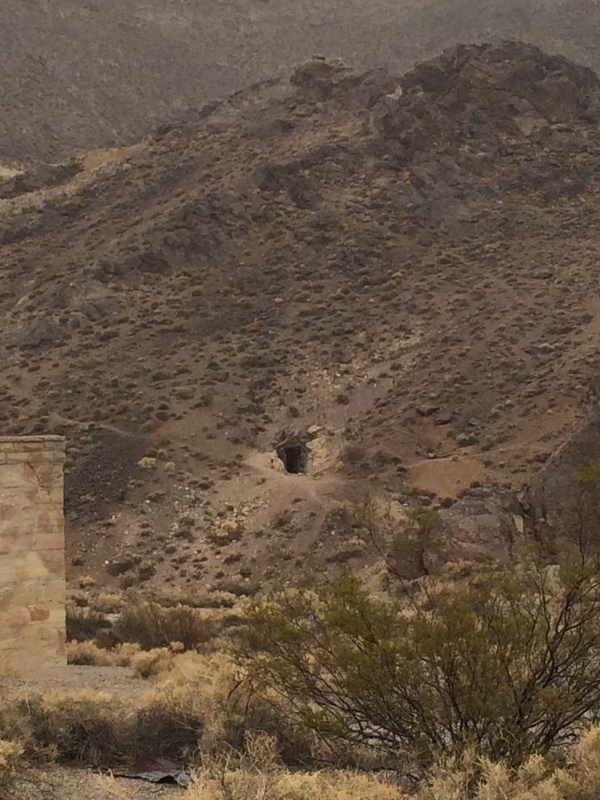 It’s a really cool ghost town to explore with lots of trails that lead back into the mountains towards the mines. 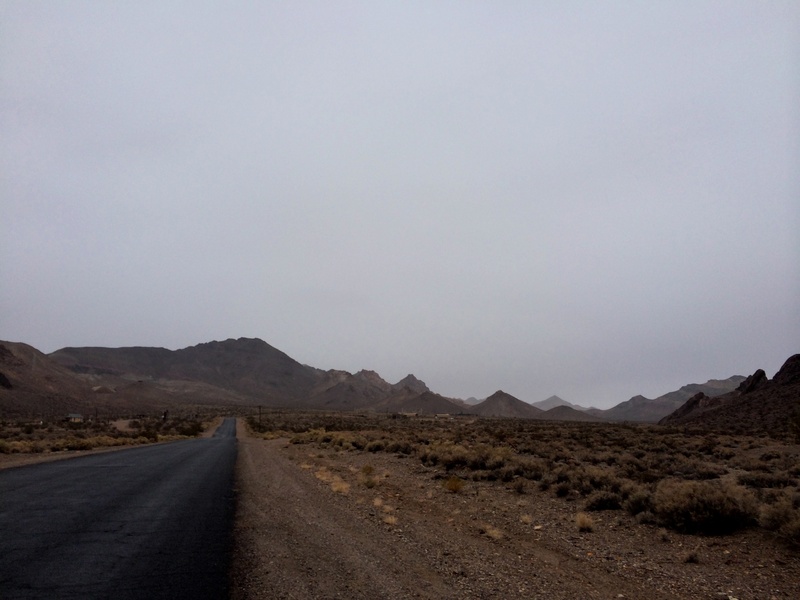 Unfortunately the rainy weather did not permit for much exploring but Rhyolite is definitely worth the stop during your visit to Death Valley! 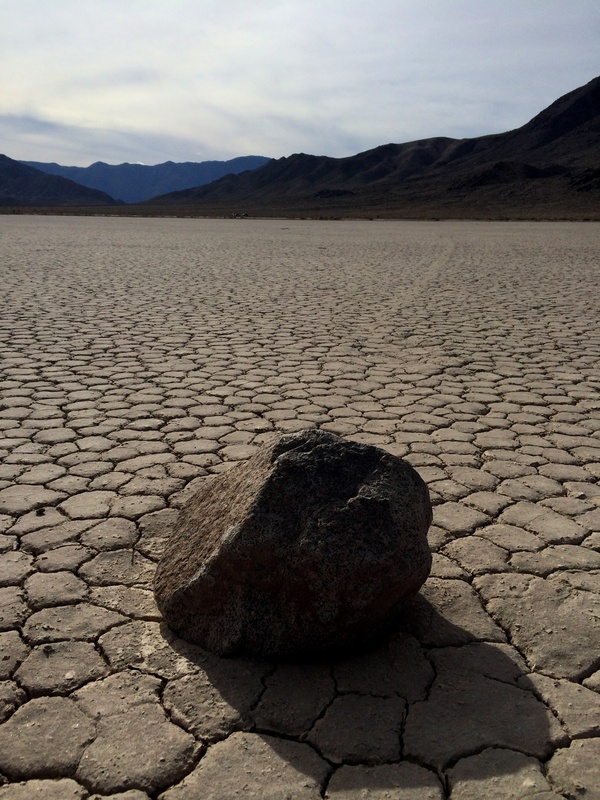 I do plan on returning to Death Valley but not sure if I will ever make the trek again to the Racetrack and it’s unique sailing stones. I would love to come back someday and hopefully see more tracks and possibly explore the Lost Burro Mine and the Grandstand, but for now I can check it off my bucket list and I’m on to my next adventure! 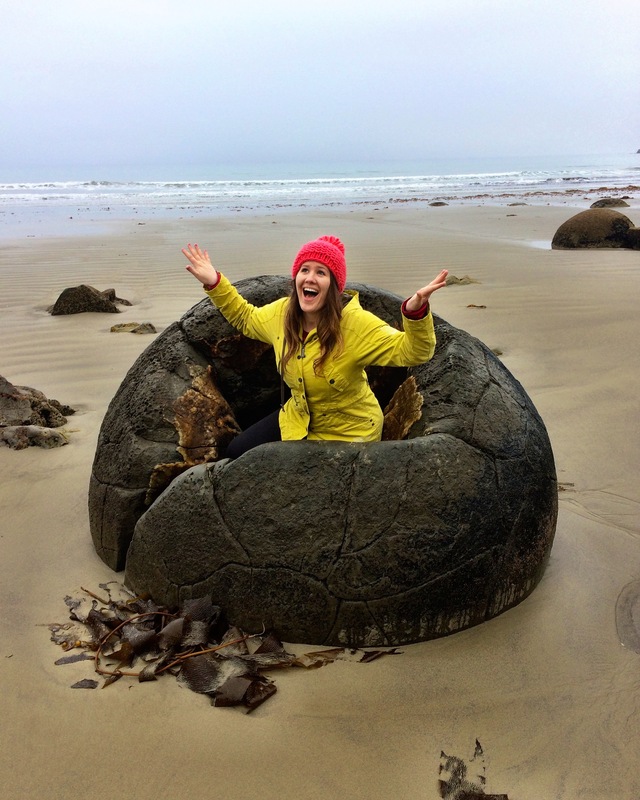 If you missed Part 1 of my Southwest roadtrip click here, and Part 2 is here!